44 Medical Construction & Design | M A RCH /A PR IL 2017 | MCDM AG.COM The rate of mental health-related emergency department vis- its is increasing. According to a 2010 study by the Agency for Healthcare Research and Quality, mental disorders and substance abuse are related to one of every eight ED cases in the U.S. or nearly 12 million visits to EDs yearly. As the baby boomer popula- tion grows older, more seniors with dementia and mental illness are presenting at EDs across the United States; patients aged ≥65 years have the highest rate of mental health-related ED visits and the highest risk ratio for hospital admission. The numbers of children and adolescents seeking psychiatric care have also increased with an esti- mated 10 percent of children having a diagnosable mental illness. In addition, drug abuse is at an all-time national high with a 98.4 percent rise in ED visits involving non-medical use of pharma- ceuticals between 2004 and 2009. At the same time, the deinstitution- alization of psychiatric care has caused a drastic decline in the number of inpatient psychiatric beds — decreas- ing nationwide from 400,000 in 1970 to 50,000 in 2006. Consequently, the ED has become the fi rst line of care for increasing populations living with mental health conditions. 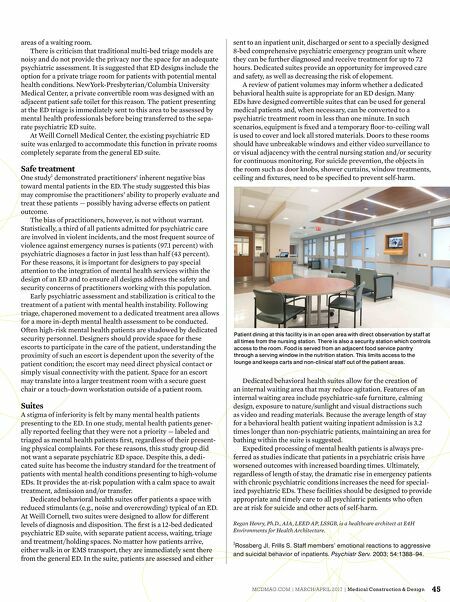 The design of EDs must, in turn, refl ect this reality by incorporating spaces for specialized care that provide a safe and therapeutic environment for the unique chal- lenges and needs faced in caring for mental health patients. Waiting and triage Immediate identifi cation of a behavioral health emergency and expedited triage is important to maintaining both patient health and atmospheric stability. One study found that although patients presenting with a mental illness receive a higher triage score as compared to other ED patients, their wait time for assessment is seven minutes longer. Designing waiting rooms with diff erent spheres or nodes al- lows for the subtle separation of patient populations. This may be achieved through furniture, color or material diff erentiation. Additionally, ensuring the safety of all patients in the waiting room is vital. 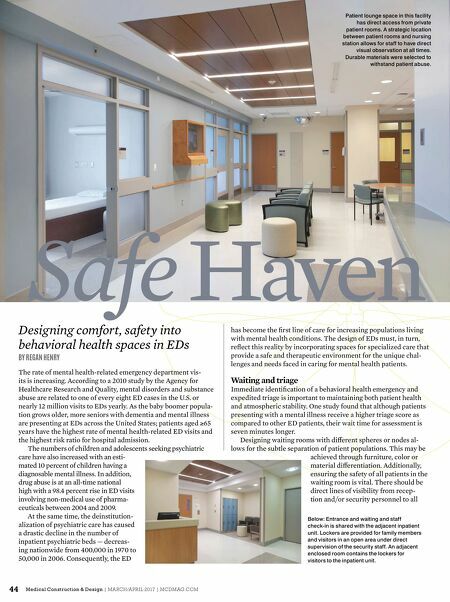 There should be direct lines of visibility from recep- tion and/or security personnel to all Safe Haven Designing comfort, safety into behavioral health spaces in EDs BY REGAN HENRY Below: Entrance and waiting and staff check-in is shared with the adjacent inpatient unit. Lockers are provided for family members and visitors in an open area under direct supervision of the security staff. An adjacent enclosed room contains the lockers for visitors to the inpatient unit. Patient lounge space in this facility has direct access from private patient rooms. A strategic location between patient rooms and nursing station allows for staff to have direct visual observation at all times. Durable materials were selected to withstand patient abuse.